WP-Lister for Amazon integrates your WooCommerce website with Amazon. You can upload your products from WooCommerce to Amazon or import existing products from Amazon to WooCommerce. First you need to visit Plugins » Add New » Upload and upload the zip file you downloaded from wplab.com. 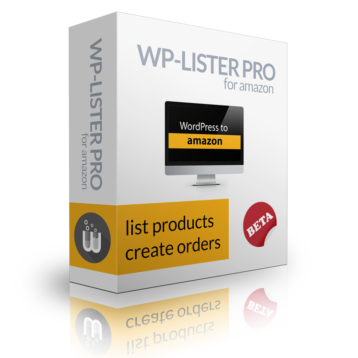 Once you have installed and activated the plugin, please follow the detailed instructions at How to set up WP-Lister for Amazon to connect your Amazon account and select your categories. If your products have already been listed on your Amazon seller account, you can easily import them to WooCommerce by following the instructions at Import products from Amazon. If your products already exist on both platforms using the same SKU, the import process will link both products and not create duplicates in WooCommerce. The workflow of uploading products to Amazon depends on whether your products already exist on the Amazon website or not. Existing products can be easily listed since Amazon already knows about all the product details for any given ASIN. All you need to provide in addition to an existing ASIN are your SKU, quantity and price. New products are more complicated to add since Amazon requires many details for each new product to be filled in – including a valid UPC or EAN. You will have to set up a listing profile using the right category feed template to populate all required feed columns. Click the icon to open a search window, optionally paste the ASIN in the search field and select the found product. There will be a new listing with status matched generated, which will be submitted to Amazon automatically. See Listing existing products on Amazon for more details. Creating new products on Amazon requires you to first create a listing profile. This might take some initial effort – however, it will save you a lot of time in the future once you got it all set up. See Creating new products on Amazon for more details. If you intend to create new variable listings, you should also read Listing variable products on Amazon.